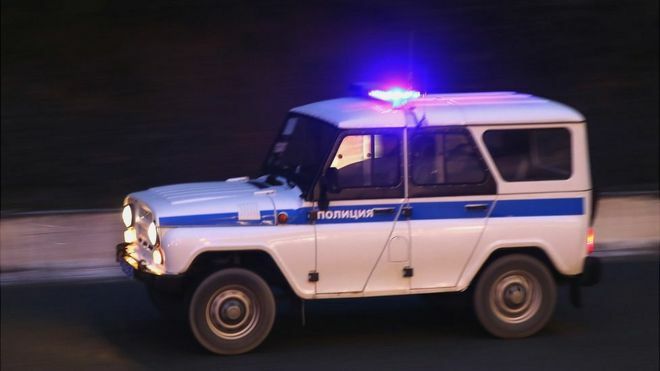 Russian police are questioning a man suspected of killing nine people with a hunting rifle in a village 150km (93 miles) north-west of Moscow. The bodies of five men and four women were found at the cottage (dacha) in Redkino, near Tver. One woman's body was found in the boot of a car. The suspect is an electrician who, reports say, turned up at a party uninvited and got into a drunken rage. A young woman survived by hiding under a blanket and called police. The victims were shot at point-blank range with a Saiga semi-automatic rifle. The suspect has been named as Sergei Yegorov, 45. Russia's Vesti TV news says he has confessed to the crime. Russian media report that he lost his temper when some guests refused to believe him when said he had once served as a Russian paratrooper. Feeling insulted, he went home and fetched his rifle, then went back to the party and opened fire, reports say. The gunman was apparently well acquainted with the group at the dacha. Among the victims was a 92-year-old woman, the owner of the dacha.